First chief rabbi of the Ashkenazic Jews in England; born at Breslau in 1670; died in the year 1756. After studying at a yeshibah in Poland, he married the daughter of R. Samuel ben Phoebus of Fürth, author of a commentary on Eben ha-'Ezer. 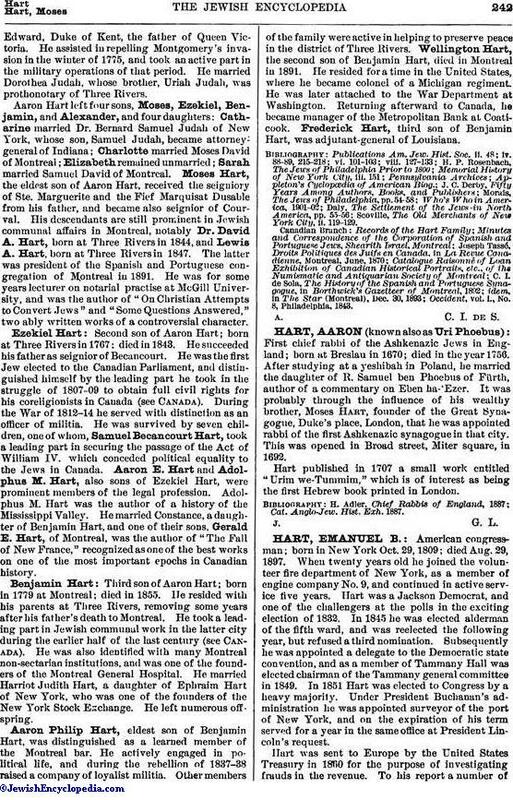 It was probably through the influence of his wealthy brother, Moses Hart, founder of the Great Synagogue, Duke's place, London, that he was appointed rabbi of the first Ashkenazic synagogue in that city. This was opened in Broad street, Miter square, in 1692. Hart published in 1707 a small work entitled "Urim we-Tummim," which is of interest as being the first Hebrew book printed in London.